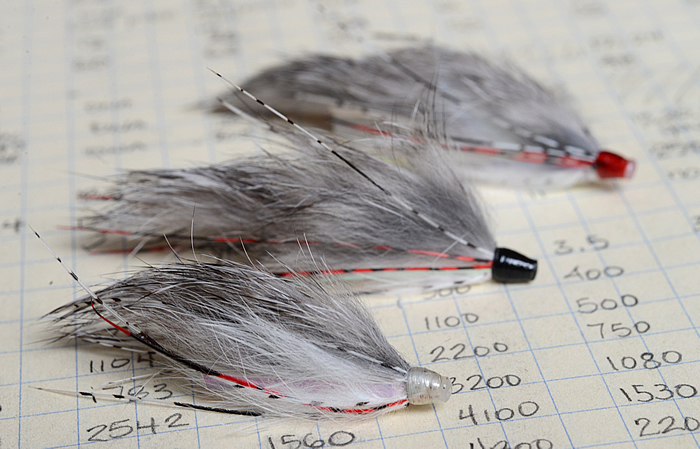 I am still experimenting and developing my eye for tube flies, but I have been tying these “Tube Bunnies” for trout. They range from 2 to 3 inches. Once done, I will have them in Grey, White, Black and a couple of Olives. Been thinking about a “sunfish” version for Bass to. I soon have to stop tying for a few weeks, so the series is not likely to be completed until November. I have a heavy travel period coming up (LA, San Diego, Dallas, Hamburg, Chicago, Cleveland), and expected to be home for 3-4 days in all of October. What little free time I have will be to cut grass, rake leaves and get ready for winter. Fishy looking flies. I have never tried tying tube flies. Is it much different? Rigging is the most different, and I think there is a greater need to “tie in the round”. The diameter is also larger on the tube, so you consume more material with each rotation.